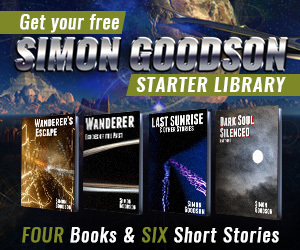 Win a signed copy of Wanderer’s Escape – just 3 days left! There’s just three days left to enter for your chance to win a free signed copy of Wanderer’s Escape. There have only been 32 entries so far so you’ve got a great chance of winning. Register now! When is the final chapter of the “Wanderer’s Odyssey ” coming out? Sorry for the delay getting back to you – I’m on holiday right now so not checking things as often as normal. There will be two more books in the Wanderer’s Odyssey – the 4th book is approaching 70,000 words at the moment so it’s well underway. At a very rough guess it may be out sometime in December or January but that depends greatly on exactly how long the book ends up being. When is book 4 of the “Wanderer’s Odyssey” coming out.? You’re writing is terrible, but the story is great! You NEED an editor. I am wary of reading your other books because I don’t want to get caught up in the story and then. have to put up with your writing. Note::” learnt” is” learned”;” lent” is a season, not a substitute for “leaned”. “she was sat on at the table” is actually “she sat at the table”. Etc..
Glad you enjoyed the books and sorry you’re having problems with the writing. Every book has been fully edited and beta read however things still slip through. In particular when I’m making changes based on feedback from the editor or beta readers as those aren’t then re-checked. I’m the first to admit there are still a few in there but the fact I’m British also causes problems for some of my readers – your example of learnt is a perfect case. In UK English learnt is not only acceptable it is far more common than learned (learned actually looks wrong to me). There are a number of words like that where I have to make a call on whether to adjust them or not. I tend to change them if they still read OK for me but otherwise I leave them – e.g. leant (with an a) gets changed to leaned. Lent – thanks, that is on my list of words to always check and shouldn’t turn up in the more recent books, and I’m reviewing the old books now. This is a mix of a typo and UK English – the word should be spelt leant, not lent. However that is one of those which I do change as leaned looks fine to me too. Do you remember which book you found it in? I’ll check them all again but it’s possible you have an older version without the corrections. “she was sat on at the table” –> that’s got all the hallmarks of me introducing a problem when I correct another mistake or improve a sentence. I’ll fix that up. I’m actually just in the process of completely reviewing the two Dark Soul books, including a full printed out re-read which flags up issues. I’ll be posting on the blog when the new versions are available and they should be cleaner than before, though I’m afraid UK English will still prevail. Last Sunrise & Other Stories is the oldest, and I’m sure the one with the most errors, and I aim to tackle that in the next few weeks too. If you found any other issues I’d really appreciate it if you let me know. One of the great things about being an Indie author is that I can fix these problems so quickly. Just wanted to give you an update on what your post triggered. First off it’s started some in depth discussions with my editor about tuning the language in the books so it doesn’t catch out american readers so much. Polling a number of friends and relatives suggests that learned definitely sounds wrong, even though technically it is allowed in UK English, and everyone would use learnt. In fact any of them seeing learned would be likely to think it was pronounced “learn-ed” which over hear means someone who is very well educated. The discussions are ongoing. The other thing I’ve done is enhanced the automated manuscript checker that I created so that it now has two additional features. One is that it checks for missing possessive apostrophes for all the names in the book it knows about (e.g. Sals would create an error as it should be Sal’s). I’ve also changed it to have a list of known problem words – those which I know trip me up at times and especially those that have managed to slip past proof reading, beta reading and editing in the past. Lent is one of the words now automatically detected and flagged, as is leant on the assumption I will be moving towards leaned there (to be confirmed). Rafflecopter Giveaway does not work. Sorry about that – I don’t know what went wrong as it was working when I published the blog and tested but it’s stopped working now. I hope everyone found the direct link in the slightly older blog post. If not, I’ll be running another giveaway in a few weeks time and I’ll make to check the link several times a day. Just finished book 3 and let out an audible “noooooooo!!! !” at the end (disappointment that the adventure is over for the moment; it can sneak up on you in the e-book format if you’re absorbed by the story as I was). Really fun read. Thanks! Can’t wait for book 4! How/when are you going to announce the raffle winners? I know – that’s one advantage print books still have. You can’t help but be aware of how close to the end you are getting. The blog entry detailing who won the competition has just been posted, I’m afraid you didn’t win – I contacted the winner soon after the draw closed but I’m still in slow holiday mode in terms of putting out blogs.